You love working with children. You love yoga. So, naturally you love teaching kids yoga, right? We’ll focus on our mindset of “being” a kids yoga facilitator in this article. I believe that we have to start from a strong foundation of our own yoga practice to make our yoga teachings authentic and meaningful for the children. When I say “kids yoga teacher,” I’m referring to all of you in your roles as a parent, teacher, yoga teacher, health practitioner, or caregiver. Whatever relationship you have with the children in your life, I believe these four steps will help you to feel calm, confident, and creative when introducing or teaching yoga to children. Why do I want myself and my children to practice yoga? Why do I want to teach yoga to children? Get curious about your intentions and aspirations in the journey of practicing yoga with children. Have you become curious about the health benefits of yoga? Or maybe you’re looking for a way to help your child unwind after a busy day or release the stresses of a busy lifestyle. Do your children need tools to regulate their big emotions? Or could they benefit from being more flexible and building strength? Do they feel anxiety during test-taking periods? Does your child have a hard time getting to sleep at night? Or are you looking for a fun and active way to bond with your students? Getting clear on your intention of introducing yoga to children will help you figure out which aspects of yoga to emphasize in order to meet the goals you hope yoga will help achieve in your classroom, studio, or home life. For example, if you’re hoping to emphasize relaxation and destressing, you should definitely include breathing techniques in your yoga practice, and you might even spend more time on the breathing than on the poses. But if you’re more concerned with having fun and moving around, the breathing techniques will be a smaller portion of your yoga time. Now is your chance to dive into researching the various building blocks of yoga, including breath, meditation, mindfulness, physical postures, physical affirmations, karma yoga, and character education. 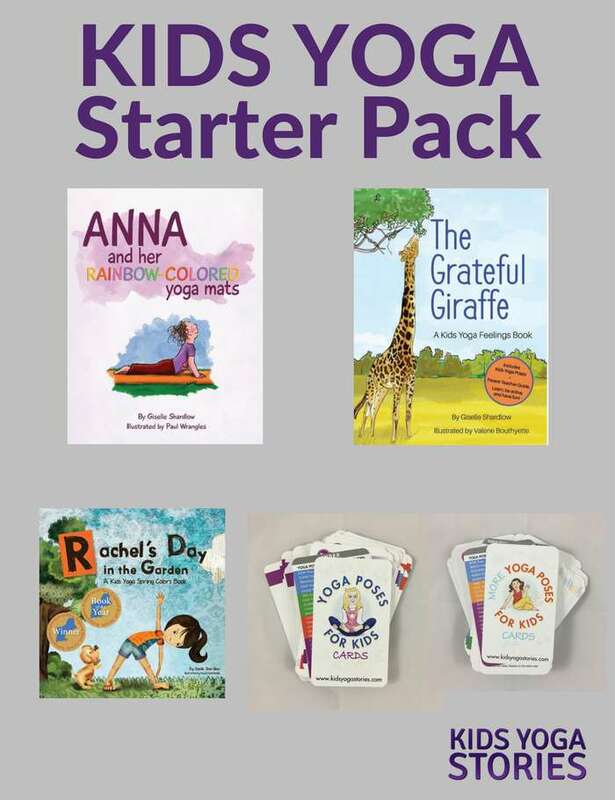 Find books about kids yoga at your local library or check online for recommendations. Check your local area for any upcoming kids yoga teacher training programs or look online. After you’ve compiled your list of potential yoga practices, narrow your list to ten yoga and/or mindfulness practices that interest you the most. Try out a few yoga practices from your list to see which ones are easiest to remember to do or ones that bring you the most joy. Don’t be too serious about your yoga practice. It’s not about getting it “right,” but about exploring various practices to find ones that work for you and your schedule. In turn, you’ll be able to introduce these practices to children with enthusiasm, ease, and grace. Which two yoga and/or mindfulness practices do I love the best? Which specific elements of the yoga practice could I make a part of my life? The purpose of Step Three is to get clarity on your own yoga practice in order to build your confidence as a kids yoga teacher. You don’t have to master every aspect of yoga. Just be confident about the elements of yoga that speak to you. How do I integrate yoga into my life (and the lives of my children) each and every day? How can I create a fulfilling yoga lifestyle in my home or classroom? Remember that yoga is a lifelong experience, not somewhere to get to or something to perfect. The purpose is to create a daily habit, just like brushing your teeth. Your yoga experiences should be easy and feel natural. That way, you’ll be a role model for your children. You could start talking about the benefits you’re feeling from practicing yoga, or they will start to see that you’ll be heading off to yoga class each Sunday, for example. Keep your yoga practices super simple and inspiring so that you’ll want to do more, not get burnt out. After some time of practicing yoga (could be a week or years), I’ve no doubt that you’ll start to feel a sense of calm, confidence, and clarity about teaching yoga to children. Teach from your heart. Teach from the benefits you personally experience from your own yoga practice. Remind yourself that you’re doing amazing work planting the seeds of yoga into your children’s lives. That seed will blossom as they use positive affirmations, physical postures, or breathing techniques to help them to be happy, healthy, and confident human beings. From the bottom of my heart, thank you for being someone to share the gift of yoga with a child. To be honest, I strongly believe that practicing yoga is one way we can spread peace throughout our planet. Save time finding yoga resources – join our digital Kids Yoga Monthly subscription! Membership won’t open again until fall, 2018. So, join today! Imagine a collection of thematic kids yoga resources landing directly in your inbox. That’s one less thing to plan in an already-busy schedule. Click here for more information on Kids Yoga Monthly. 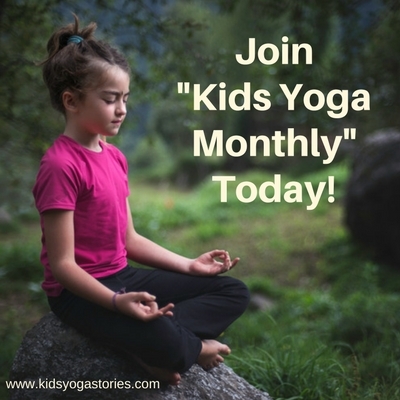 Join Kids Yoga Monthly Today! 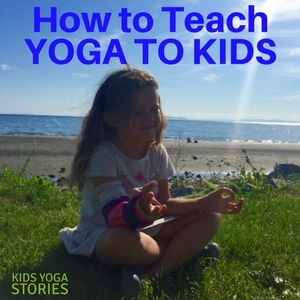 How do you get started with kids yoga? 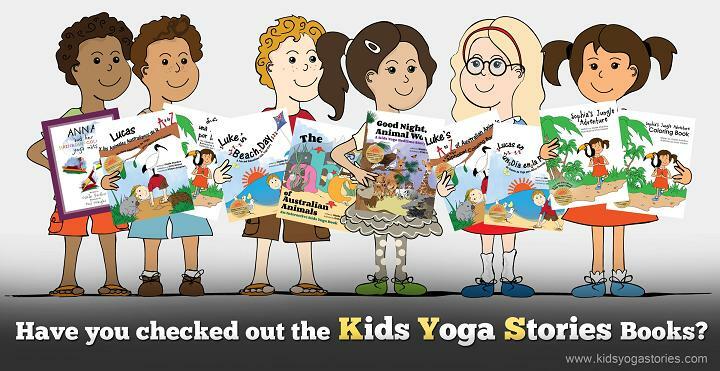 Purchase the Kids Yoga Starter Pack here. I have the grateful giraffe. would love your award sticker to put on the cover!